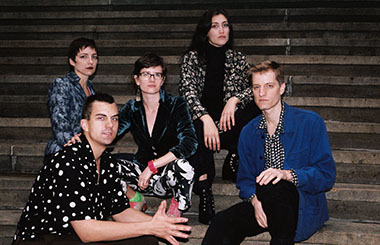 New York art-pop five-piece Bodega will bring their highly hyped live show to Whelan’s Dublin, February next year. Bodega are filmmakers and vocalists Ben Hozie and Nikki Belfiglio with Montana Simone (drums), Madison Velding-Vandam (guitar) and Heather Elle (bass). The tunes are full of razor sharp and direct social observations that are both smart and funny, asking audiences to think while they dance. A busy Summer for the dance punks boasted two buzzed-about performances at The Great Escape festival where their second show drew a line down the street over an hour ahead of show time. Less than a month later the band released their debut album Endless Scroll, which exemplifies their unapologetic socio-political narritve.